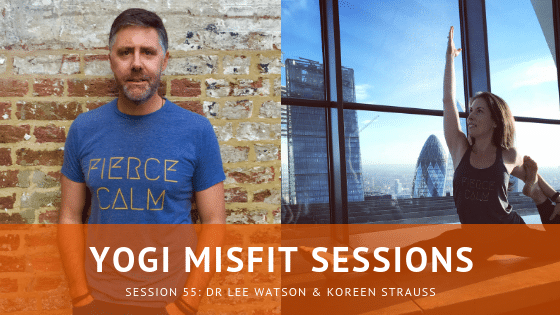 For this week’s session, I’m so happy to be sharing with you guys the amazing Dr. Lee Watson and Koreen Strauss – the awesome individuals behind Fierce Calm. Fierce Calm is a platform that allows people who identify with the words “yoga saved my life” to share their stories. Their community offers a safe place for people to come forward and share their experiences. Being able to share how we feel and what’s happened to us is so important in helping us heal and grow. We shouldn’t have to hide our pain and feel like we’re alone in this world. Because we’re not. For those of you who know me, yoga was the only thing that really saved me when I felt lost to the world and like I had nothing. I can’t champion this initiative enough. I believe in with all my heart. I’m truly humbled to be the Global Ambassador for Fierce Calm, and I hope to bring awareness as to how yoga can change people’s lives for the better, just as it changed mine.